You want something that looks good, yes, but also something that is meant for bathroom use (duh) and that will be easy to maintain given your time and abilities. This is your go-to guide for learning more about the different types of bathroom tiles. It will help you make the best choice for your purchase and give you the basics of cleaning and maintenance. Glass tile is among the oldest type of mosaic tile you'll find. Ancient Greeks and Romans used glass to beautify their homes, along with other cultures in the Middle East and Asia. Despite its age, glass tile has never gone out of fashion. For the 21st century, glass tile is still an affordable, stylish and practical solution for bathroom walls, backsplashes and even shower/bath tile. Style. Glass tile comes in an almost infinite variety of shapes and colors. Transparent, semi-transparent or opaque, shiny or matte, in all the shades of the rainbow: whatever your dream style, it probably exists in glass. Bathroom-friendly. Glass tiles are resistant to humidity and moisture, stains, fungus and mold. Durable. Glass tile is known for its durability. Although it is prone to scratches, it is overall resistant to breaking and signs of use. Easy to maintain. Because of its durability, glass is easy to clean and maintain. Your usual mild surface cleaner will do. Affordable. Glass is a beautiful yet affordable material because it is easy to produce. If you don't have a style in mind, you need to first begin by choosing what kind of tile you want on your walls. Do you want something clear and minimalist, or something dramatic and dark? The first thing you must do is calculate the space you plan on covering with glass tile. This will determine the cost of your whole project. Once you have the surface measurement, you can start looking at tiles that fit your budget. Most glass tile comes in squares and is sold by the square foot. 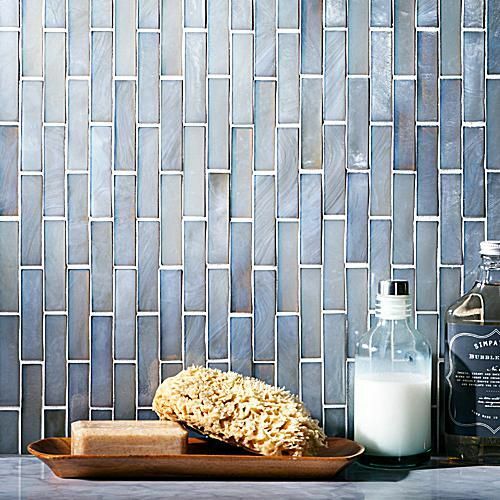 Simple glass mosaics can sell for as little as $3.50 per square foot, while designer series can sell for up to $20 per square foot. Something within that range will surely fit your budget! The Home Renovations section has a great article for learning how to install glass tile by yourself. If you're not confident you have the right skills, ask a handy friend to help out or hire a professional. Glass tile is easy to clean. You don't need anything exceptional; a mix of soap and water, or better, water and vinegar in a spray bottle. Spray, rub a little with a soft brush for stains and grout (always gently to avoid scratching!) and wipe off. The benefit of glass tile is that it is not porous, so it doesn't absorb liquids or stains. All you need is to wipe it off. If you prefer a more natural, neutral look, natural stone might be an excellent choice for your bathroom tile. Made directly from natural stone and finished and sealed to resist stains, humidity and mold, stone tile has a beautiful look that isn't to be ignored. Natural stone tile has plenty of beneficial characteristics for your bathroom. Beautiful patterns. The natural patterning of stone is preserved, giving your room a unique look. Durability. Stone is naturally durable, whether it's used for flooring or on walls. Variety. Natural stone tile comes in many materials: marble, travertine, quartz, granite, slate, limestone, sandstone. Not all of these are appropriate for a bathroom---do consult an expert when making that choice. If you've chosen the natural stone way, you need to plan your purchase properly. The first step is to have a general idea of the color and patterning you would prefer. Bring color chips for inspiration with you to the store, as well as the total surface you plan on covering. Granite and soapstone are perfect choices for the bathroom, since they are less porous than other stones like marble or slate. However, each stone will require at least a bit of maintenance and cleaning. Stone tile also comes in squares or rectangles, usually sold by the square foot. Marble and granite are sold at the higher end of the spectrum; for cheaper choices, opt for travertine. Stone tile can be installed with or without grout. You might want to consult an expert and make sure you are installing your stone properly, because not all stone types are installed the same way. Each stone will need a different type of cleaning routine. More porous stones, like marble or soapstone, require a regular sealant treatment to keep them stain- and humidity-resistant. Consult an expert about your stone tile to make sure you are using the right kind of cleaner; some cleaning products may actually damage stone surfaces. A great thing about ceramic and porcelain tile is its price. For those with a low budget and designer tastes, ceramic or porcelain might actually be the best choice. Ceramic and porcelain come in a variety of styles, colors and textures. They are as versatile as they are beautiful, and they are perfect for the humid conditions of a bathroom. Affordable. You won't break the bank with these tiles! Stylishly versatile. Any decor style will do well with porcelain. Traditional, rustic, modern, contemporary, eclectic, Asian, etc. : all can benefit from the look of porcelain and ceramic. Great for the bathroom. Porcelain and ceramic are moisture-, stain- and scratch-resistant. Accent or focus. Whether you're thinking about an accent wall or a whole floor, ceramic and porcelain will do the job. As always, begin by choosing your style and colors. The benefit of porcelain and ceramic is that they come in many, many different styles, from white-marble-like to dark and moody. Measure the surface to be covered and calculate the price by square foot. Ceramic and porcelain tile cost as low as $1.69 per square foot and are the perfect low-budget, high-style choice. Installing your newly purchased tile is easy---but it's also easy to do badly. Here's an About.com tutorial on how to install your porcelain or ceramic tile properly. Of course, if in doubt, don't be afraid to ask your DIY expert friend or neighbour, or hire a professional. Sometimes it's worth investing in a little help if you want to maximize on your investment. Cleaning porcelain and ceramic tile is easy. However, cleaning products and techniques will vary depending on whether the material is glazed or unglazed, so make sure you know which one ahead of time. These tutorials for cleaning porcelain floors and ceramic floors can easily be applied to bathroom tile---just switch a floor mop for a hand cloth. There you have it! Three different types of tiles come at different prices and have different styles. If you like variety and color, glass tile is perfect for you; lovers of luxury and natural materials will love natural stone; people on a budget will appreciate the durability of ceramic and porcelain.